An advertisement for the Page Theater, published in the October 14, 1916 edition of the Medford Mail Tribune. “Last Time Tonight…Thos. 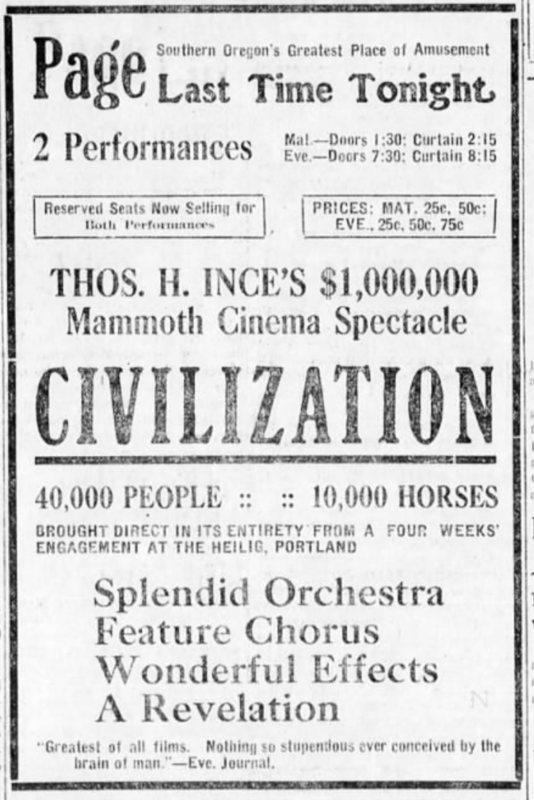 H. Ince’s $1,000,000 Mammoth Cinema Spectacle,” reads an October 14, 1916 advertisement for the Page Theater in the Medford Mail Tribune. This advertisement would have likely been quite successful in attracting a crowd for several reasons. The first major draw is illustrated in that opening excerpt, “Last Time Tonight.” The Oregon Blue Book describes that despite the state of Oregon’s 1913 creation of the State Highway Commission, “the ‘good roads’ campaign took on real life in 1919.” In 1916, traveling outside of Medford would have required quite some effort. Since the planning of drivable roads was still in its infancy, Medford residents would have to embark on a long journey to catch the next showing of Civilization elsewhere. The advertised warning of the show’s final run would instill a sense of immediacy and importance for anybody wishing to see the film. Another advertising ploy that likely would have been successful is the description of the film’s prior success, calling it “Thos. 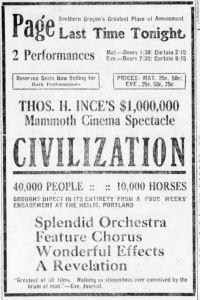 H. Ince’s $1,000,000 Mammoth Cinema Spectacle.” Adjusted for inflation, that would make Ince’s film a $22,084,424.78 success in 2018. While this is would not place the film in the highest grossing film rank, it would certainly suggest a certain level of popularity. The Page Theater advertisement also states that the film was “brought direct in its entirety from a four weeks’ engagement at the Heilig, Portland.” According to Shawna Gandy of Archives West, the Heilig Theatre accommodated nearly 1,500 patrons. The fact that the film attracted enough buzz for four entire weeks in Portland was one thing. Another was that the Page would be showing the film “in its entirety,” so Medford residents could expect to see the whole film; this contrasted a showing of short clips. In compiling each of these pieces of praise and positive descriptions, the Page Theater created an advertisement that would very likely appeal to a large population of residents of Medford, Oregon in 1916. Gandy, Shawna. “Heilig Theatre Photographs Collection, 1888-1929.” Archives West: Heilig Theatre Photographs Collection, 1888-1929, Archives West, 2006, archiveswest.orbiscascade.org/ark:/80444/xv49603. “Oregon History: Mixed Blessings.” Oregon Blue Book, Oregon Secretary of State, 2017, bluebook.state.or.us/cultural/history/history24.htm. Tolstoi’s Master Piece at the Star”.Corvallis Daily Gazette, 26 June 1909. This article appeared in the Corvallis Daily Gazette in June 1909. The article discusses the recent motion picture to arrive in Corvallis, Resurrection. As the article describes the motion picture was adapted from Tolstoi’s novel which the article describes as “melancholy.” Resurrection was a free adaption directed D.W. Griffith and produced by Biograph. The article goes on to pronounce how it is interesting to see the story acted out in front of viewers rather than just on paper. Seeing as motion pictures were still a relatively new and developing technology by 1909 seeing stories that audiences have only read would have been an exciting and new concept. The article continues on to quote the Motion Picture World and its review of the film and its original impact on audiences in New York. The film seems to have sparked interest in New York audiences. It is noteworthy that this article chooses to incorporate this ambiguous quote about the showing of the film in New York. During this time New York still had a very prominent role in the motion picture industry therefore one would imagine it being just as important as quoting how the release of a film in Hollywood went today. The quoted passage adds how Biograph did a great job of depicting the story and the characters as compared to the “original play” as well as a great admiration for an actress’s emotions towards the camera. 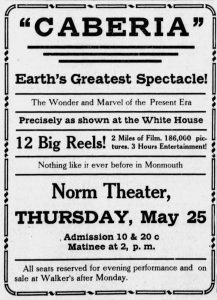 This article appeared in the Gazette on June 26, 1906, and as it states the film had premiered the night before at the Star Theater in Corvallis. According to the American Film Institute Catalog, Resurrection premiered May 20, 1909, meaning that this film reached Corvallis only about a month after its original release. This indicated that Corvallis would have been a prominent town for viewing films. Around 1909 there is only mention of one other theater in Corvallis which is the Palace theater which does not seem to have shown Biograph’s Resurrection. The First Motion Picture Shown at the White House! 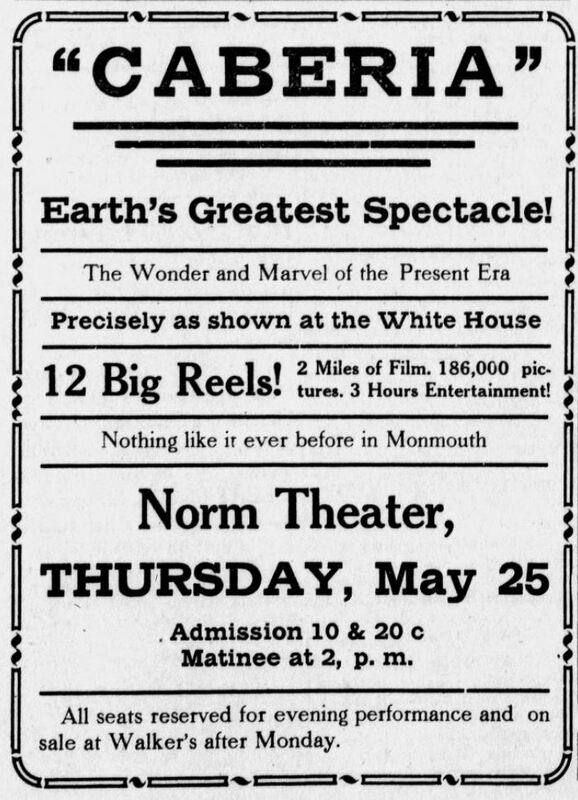 In this advertisement for “Caberia” in Monmouth, Oregon from the May 19, 1916 issue of the Monmouth Herald, the advertisement found on page 6 makes great exclamations about this film “CABERIA” coming to the town. With exclamations such as “Nothing like it ever before in Monmouth”, “Earth’s Greatest Spectacle”, and “The Wonder and Marvel of the Present Era”, we are able to deduce the true popularity and success that this film had cultivated in the town of Monmouth. When finding this advertisement, the phrase that stuck out most to me was “Precisely as shown at the White House.” I found this phrase interesting to include in an advertisement all the way in Monmouth, Oregon and I began to wonder about the origins of this phrase and why the manager of the theater and/or the advertiser decided to include this information and what they were referring to with its inclusion within the advertisement. Upon further research into the matter I found that the newspaper had actually misspelled the popular Italian film of the time, Cabiria (1914). During my research, I learned that Cabiria was “the first motion picture to be screened on the grounds of the White House” (Drees). With this historically significant fact taken into consideration, we can begin to understand the true impact that this film had not only on the town of Monmouth, Oregon, but the United States as a whole. Though the advertisement does not include much information about the film itself other than length (“12 Big Reels”) and run time (“3 Hours Entertainment!”), the positive reception of the film speaks volumes for the film and sufficiently advertises that this film is one not to miss. With the main focus of the advertisement to publicize the coming hit attraction to Norm Theater, the advertisement also includes the admission cost and states that “all seats reserved for evening performance.” This phrase further indicates the true success of this film by demonstrating that seats must be reserved in advance in order for citizens to view the film. With the influence of newspaper articles and advertisements driving the success of numerous theaters and motion picture programs, we can see firsthand with this advertisement how true success and influence was cultivated within the town of Monmouth, Oregon for the film. Through the inclusion of these overly positive phrases, we can see how the manager and/or advertiser were able to manipulate and persuade the citizens of Monmouth, Oregon to go to Norm Theater in order to view the film. “Caberia.” The Monmouth Herald [Monmouth], 19 May 1916, p. 6.